Starke offers a new line of innovative industrial products designed and engineered for quality and affordability. 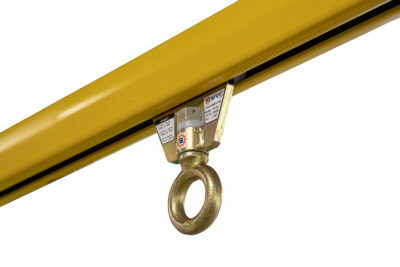 The Starke lineup includes electric chain hoists, trolleys, crane components, and fall protection. Starke is ready to go to work. Additional products and information will be added to Starke in the coming months. Check back regularly or sign-up to be notified of new products and important news. For additional info, pricing, or service for a Starke product, contact us, and we will assist you or put you in touch with a distributor in your area. 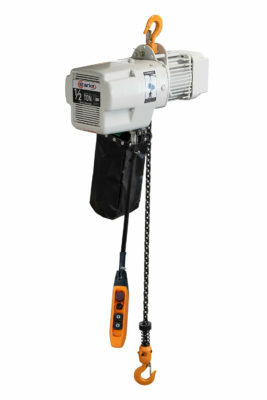 The Starke Single Speed Electric Chain hoist is the most popular solution for many standard applications ranging from high production assembly lines and work stations, to maintenance shops or hobby garages. 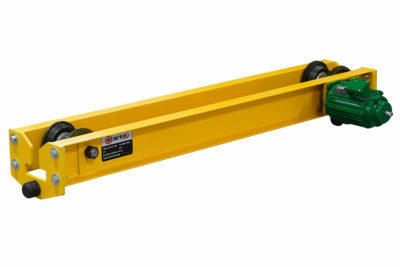 Lift capacities are available from 1⁄2 Ton – 5 Ton with lift speeds up to 26 FPM. The Starke Variable Speed Electric Chain Hoist pushes the frontier with infinite speed adjustability right at the operator's fingertips. 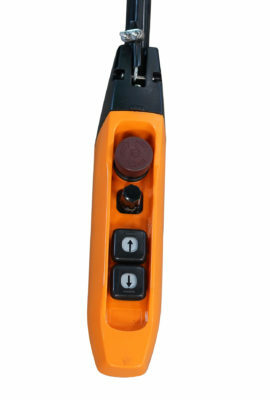 Easily adjust the speed on the ergonomic pendant with a simple turn of the knob even while the hoist is in motion. 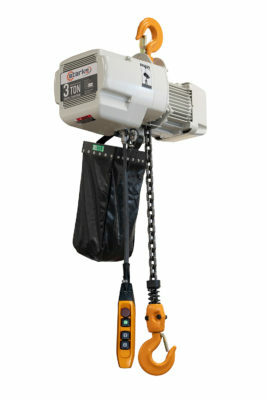 The Starke Variable Speed Electric Chain Hoist gives the operator ultimate control and makes precision movements easy. Lift capacities are available in 1⁄2 Ton, 1 Ton, and 2 Ton models all with variable speed ranging from 1 – 26 FPM. 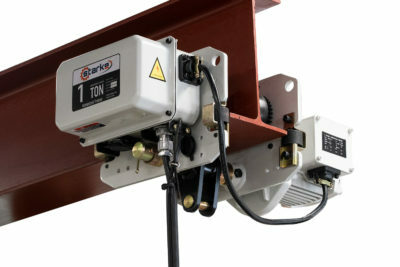 The Starke Variable Speed Trolley is a great solution whether coupled to a new Starke hoist or an existing hoist from a different manufacture. Featuring hook type and lug type mounts where height is a concern, Starke Motorized Trolleys are certain to have a model to fit your application. 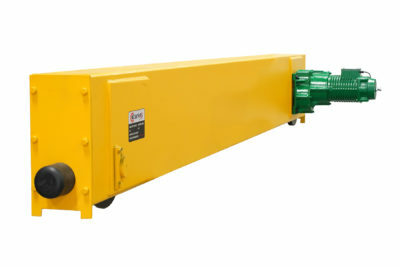 Capacities range from 1 – 5 Ton with travel speeds reaching 82 FPM. 1 Ton: 2.3 – 7.75"
2 Ton: 3.2 – 9.25"
3 Ton: 3.9 – 9.25"
5 Ton: 3.9 – 10.875"
Simple and true. The Starke SPT Series Plain Trolley is a great option where a motorized trolley is not needed. 1⁄2 Ton: 2 – 8.7"
1 Ton: 2.75 – 9"
2 Ton: 3 – 8.75"
In today's workforce, safety is becoming more important than ever. 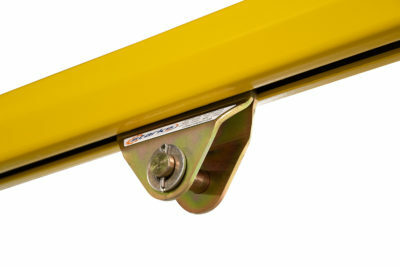 Keep your customers and team members safe with the all new SFT Series fall arrest trolleys. 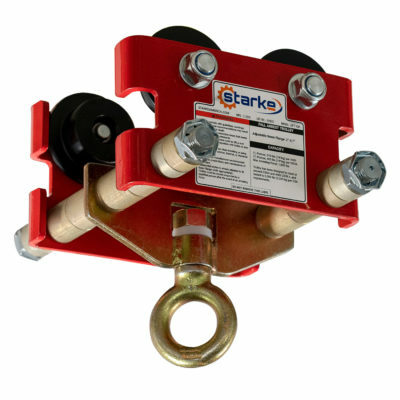 Starke offers (3) trolley models, all of which have been tested to meet and exceed OSHA & ANSI standards. 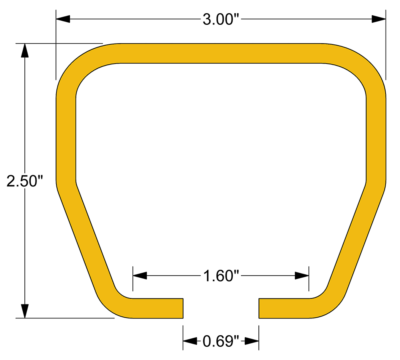 All models feature a Universal Swivel Ring with an 11⁄2" eye opening made to fit most self-retracting lifelines or safety lanyards. Beam Flange Width: 2 – 8.7"
The SFT100 is the most ergonomic and lightweight Personal Fall Arrest Trolley. Featuring an aluminum frame with powder-coat finish, this trolley weighs only 16 lb. The SFT100 has little resistance when moving up and down the length of an overhead system making it a customer favorite. The SFT200 is made of carbon steel with yellow zinc coated finish and is the most economical Personal Fall Arrest Trolley. While very similar in design to the SFT100, this unit weighs 22 lb and is more suitable for the occasional user rather than the full 8-hour shift. 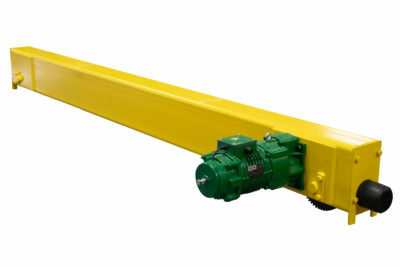 The Starke 300 Series Enclosed Track and Components are versatile and suitable for many industrial applications. 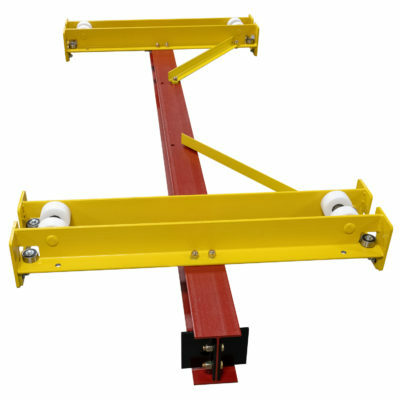 The lightweight construction of the trolleys, and clean enclosed track reduces resistance. 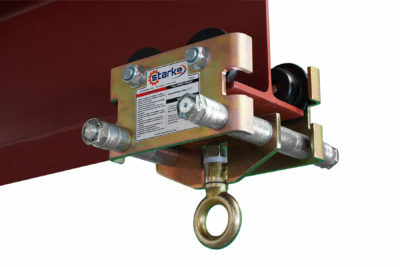 Starke offers a Fall Arrest Trolley, Hoist Trolley, Plain Track, and Custom Designed Trussed Track for various applications including fall arrest and workstation crane applications. 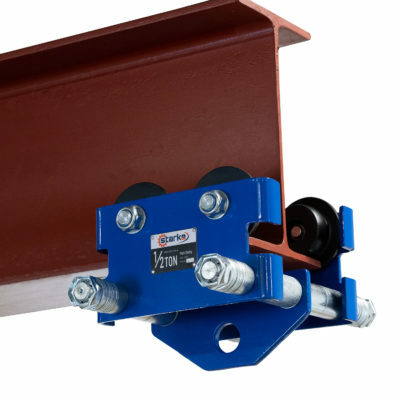 Starke 300 Series Track has been engineered to work well as a medium-size option for a variety of applications from workstation cranes, to fall protection, to jib cranes. Featuring 7 gauge Grade #50 carbon steel and available in lengths from 21' to 53'. A Secondary Brake Device often called a load arrestor is required in many industrial applications for vertically traveling equipment. 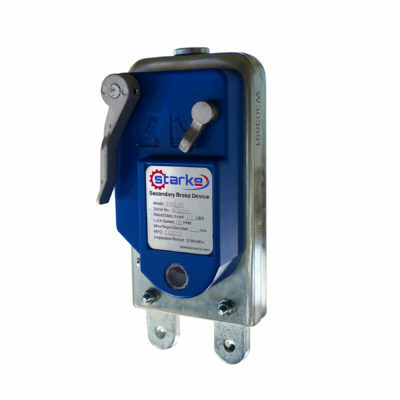 In the event of a lifting hoist failure, the Starke Secondary Brake Device is always ready to stop the fall and safeguard against personnel injury and equipment damage. 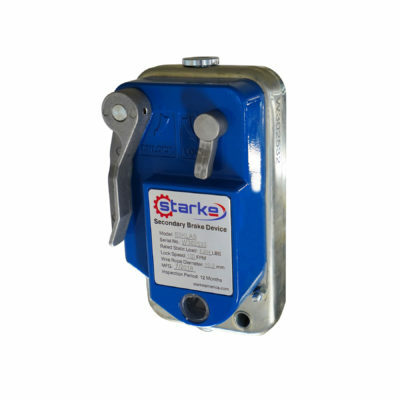 Starke offers a 2,204 lb and 3,527 lb capacity secondary brake device. Using overspeed detection, precision jaws clamp down automatically in the event of a fall without causing damage to the wire rope. Starke Control Panels are built and assembled in the USA with attention to detail while using only the best components. Although these panels are designed mainly for motorized travel overhead cranes, they can also be easily setup to control any motor or series of motors for a similar machine application. 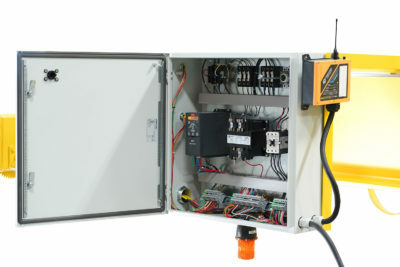 Starke can build a custom control panel for specific voltage, horsepower, and brake voltage. For additional information in regards to product specs, warranty, service, or repair please fill out the contact form.